Three people were killed and several injured when their coach crashed on a German motorway near Dessau, 110km southwest of Berlin. 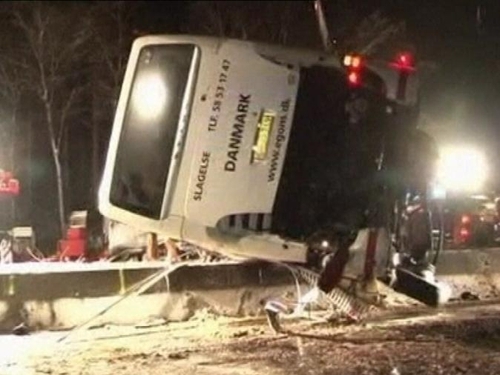 A regional police spokeswoman said the coach overturned after it clipped a metal safety barrier. The three dead were all adults, and some of the casualties were critically injured. The coach left Berlin late Friday with around 65 Danish passengers, a majority of them children. A crane was needed to remove the coach from the motorway early today. Police have opened an investigation into the cause of the crash. There have been numerous accidents this winter on German motorways caused by snow and black ice.